Porsche has developed an electric Cayman. The bad news is that they don’t plan on selling it. The good news is that it previews the impressive technology that will be introduced with the upcoming electric Porsche Mission E sports sedan. 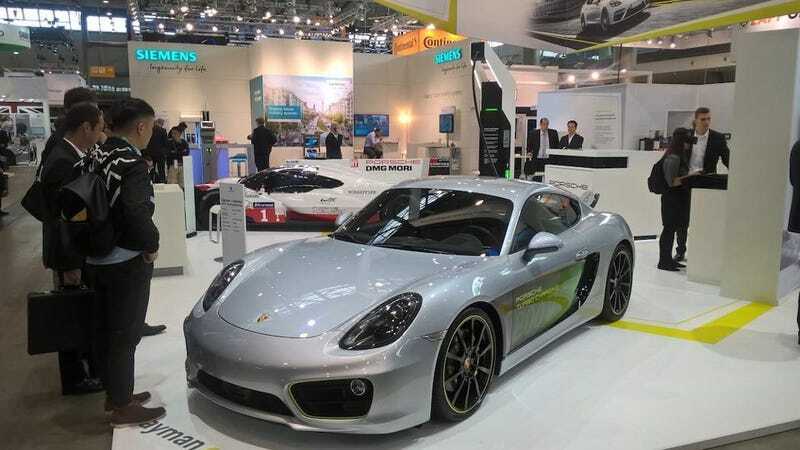 According to Porsche, the Cayman e-volution has an electric range of approximately 125 miles with performance capable of setting a 3.3 second zero to 60 mph time. Porsche clarified that it plans for the actual production Mission E to stretch its electric range to around 300 miles (500 kilometers). When Porsche decided it was going to go ahead with its Mission E concept for 2019, it also made the bold claim that it would develop a charging system that could juice up the car with an 80-percent charge in just 15 minutes. The new Cayman e-volution has allegedly stayed true to that claim. Porsche debuted its “Porsche Turbo Charging” system, which it claims is capable of juicing up to 320 kW per vehicle. It’s a 800-volt system, compared to a Tesla Supercharger’s current 480-volt system that can provide up to 120 kW of power per vehicle. Porsche sticks by its original claim that the Mission E will be able to charge to 80 percent capacity in just 15 minutes. This (confusingly named) Turbo Charging system will be the part of a “high power, fast-charging network” across higher-trafficked areas of Europe in a partnership between Volkswagen Auto Group, Mercedes, BMW and Ford, as well as additional similar networks. This is all shaping up to satisfy the intriguing and attractive premise of the Mission E when it finally starts stealing Tesla customers at the end of the decade, but can we please linger on this concept of an electric Cayman a little bit longer?